You must make reservations at least 5 minutes in advance of the time at Black Ship Little Katana. 11 a.m. - 2 p.m.
Self-parking validated up to three hours. Valet $30 overnight. In 1852, Matthew Perry, father of the USA Steam Navy, was assigned a diplomatic mission by American President Millard Fillmore to open Japanese ports to the west trade. The Admiral sailed 4 steam ships from Norfolk, Virginia to Japan. Along that trip the salt water stained the metal ships black. At that time, the Japanese had never seen such machines and referred to them as the “black ships”. This is where we take our name. Perry didn’t just open up Japan but all of Asia. This fateful meeting of the East and West cultures plays out in our menu. You will find our creative spin on traditional Japanese, Korean and American dishes. 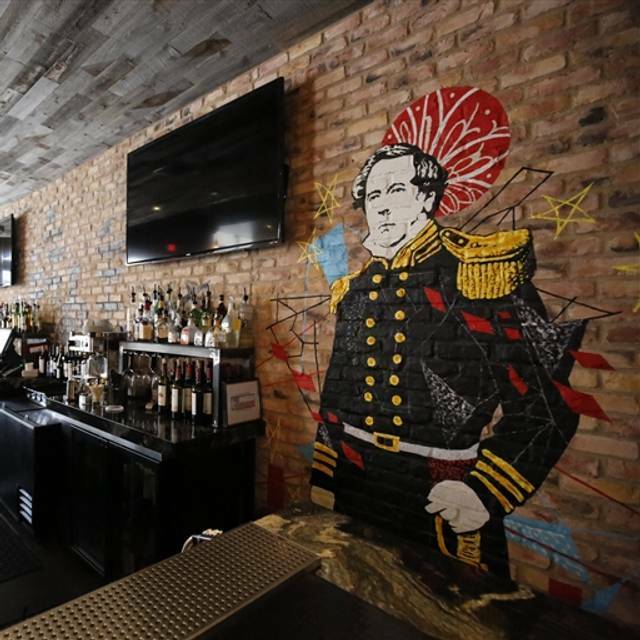 Black Ship is the 'East meets West' of the Restaurants on Lamar collection. Diners will enjoy the flavors of Japanese, Korean and American dishes as they devour the freshest sushi, refreshing sake and mouthwatering Wagu steak. The food was very good. We had a party of five and ordered an array of menu items including nigiri, sushi rolls, chicken katsu and yaki soba noodles. For dessert we order both the mango and coffee mochi as well as the flourless chocolate torte. Everything came out very well and in a timely manner. Service was okay, not great, not bad. It was extremely slow for being a Friday night and seemed like the front of house staff was taking advantage of the downtime. Overall if you want good Japanese next to the Omni, stop in. Expect good food but lackluster service and you won’t be disappointed. Excellent sushi and service. Location and parking (validated!) is perfect for those in Downtown. All of the food was very good! The portions were a good size and value for the price. All of the servers were kind and helpful. Our service was a bit slow, there were not very many people on the dining room but they did have a large party in the back room. We ordered Shrimp Shumai - DELICIOUS! Sizzling Dumpling Soup - Delicious! Spicy Tuna, Spicy California and The Angel Roll. All were delicious I enjoyed the Angel Roll - It had Burdock around it (this is a root vegetable) it was an interesting combo and very good! I would recommend everything we had. Serice was great but food wasn’t so just ok..We expected better tasting food. Great food, great sushi bar. I bet it gets super busy during hotel events. Went for a lunch date. Had a bento box with salmon. Everything was delicious! Will definitely be back! Terrible sushi and very poor service .. I was one of only three tables there and the waitress was more interested in messing around in the kitchen with the chefs than the customers. Then brought the bill to which I hadn’t asked for !! Maybe I wanted something else like a desert or coffee!! Wonderful restaurant with good sushi! I will be back. My boyfriend and I went for our 1 year anniversary, and it was lovely! We started off with sushi, and it tasted great, very fresh. For dinner my boyfriend had the steak, it was so buttery, needed no sauce. I had the Idaho trout, cooked to perfection. The staff was very attentive, the place was quiet and intimate with the lights dimmed. We will definitely go back. 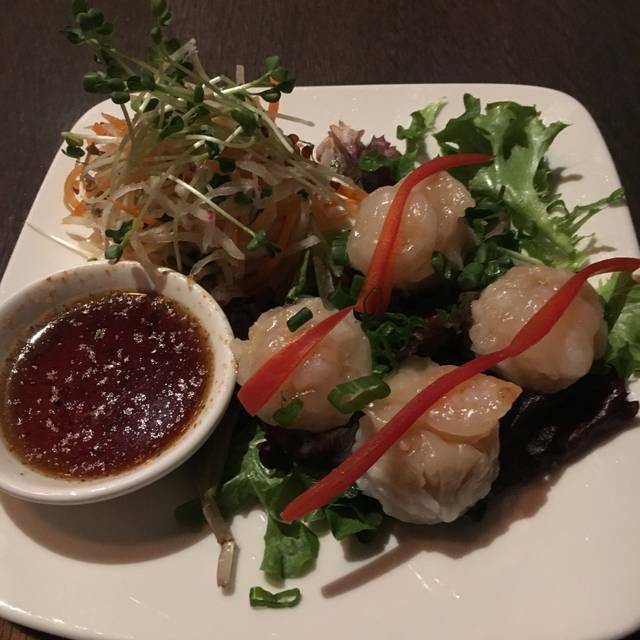 Really good rolls and excellent service! We sat at the sushi bar during lunch and were greeted quickly. I wasn't expecting much with this restaurant being part of the Omni hotel, but the rolls were really good! It was a really cute place, but the food was just okay. Definitely not bad, but personally not one of my favorite Asian fusion places in town. I’d say visit if you’ve tried a lot of places and want something new. The food was good but the hostess told the person I was meeting for lunch that there were no reservations and no one was waiting for anyone in the restaurant. Thus he stood at the front of the restaurant for 10 minutes waiting for me to walk in when I had already been seated at the back for 15. The restaurant was not very busy but service was also quite slow. The sashimi was delicious and the sushi was great as well. I do wish it was easier to make modifications to the food. Though the planned one hour lunch ended up taking at least an hour and a half, I might come back for dinner or go to Little Katana on Cole since it is smaller and less likely to have a similar situation occur with the hostess. 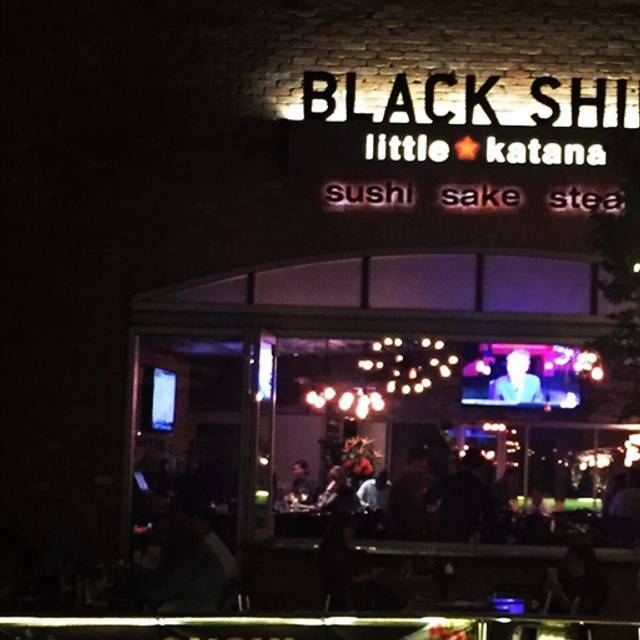 We walked in to Black Ship Little Katana at 7:00pm on a Friday night - this was our very first time here. Being downtown on a Friday evening, I came in kinda expecting the place to be busy. Instead we were walked to the very back of the restaurant to be seated at our table and we passed a grand total of 7 patrons. It was a ghost town. Our initial thought was that the public was privy to information that we were not (bad service? bad food? what's the deal??). Instead we found that the restaurant had solid ratings all around, we just chose a bad time to come (immediately after happy hour ended). By the time we left an hour or so later, the total number of patrons had increased to 10-12 - still a very weak crowd. The bar next door was pretty busy though. Overall our experience was good, but it did not meet expectations. I'm glad we gave it a try, but I don't expect we'll ever visit again. There are plenty of sushi places closer to home with better quality food, a bigger variety, and better pricing. 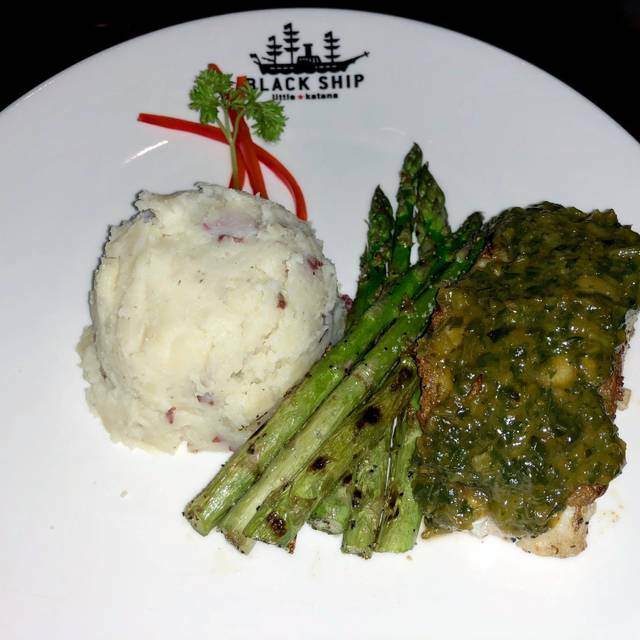 We have been to Black Ship Little Katana several times. It has become our go to special occasion restaurant. Enjoyed this restaurant. We were staying at the Omni Dallas and just wanted something close by and we could walk over. We sat outside as the air conditioning was too cold. Ordered sushi and a salad and enjoyed both. Service was great. Food was great. I would go back! Not a great atmosphere. All staff have lackadaisical attitude. Took a while to be sat even with a reservation and the place was empty. I can see why now. Food was mediocre and service was about the same. The Knox location is worlds better. We were staying at the Omni for a convention and thought that BSLK would be packed so we made an Open Table reservation. Surprisingly, there were only a few tables occupied when we arrived. The miso soup was hot and flavorful, and a nice sized portion as well. Nothing ruins the start of a meal like luke warm soup. A great start. I had the miso glazed seabass with grilled asparagus and wasabi mashed potatoes. A picture of this dish is attached. The fish was cooked perfectly, moist and flaky. The asparagus was tender and had a delicious "grilled" flavor. The mashed potatoes were the perfect starch accompaniment for the dish. My wife was looking for something vegan or vegetarian for her meal. Our server said she could substitute tofu for the protein of most any dish. So, she ordered the yakisoba noodles with tofu. She really enjoyed the dish. I was able to steal a couple bites of her noodles and the flavor was outstanding. Needless to say, our plates were clean when they were picked up by the buser, with no room left for dessert. Our server was not very personable, but did her job in a professional manner. Especially when I'm out of town, I enjoy interacting with the servers and getting to know the area better, but maybe she preferred to give us our privacy. We returned the day after for lunch and sat at the sushi bar. The sushi was excellent and our server was very personable and helped us greatly with the menu selections. I wish we lived in Dallas as we would definitely be a regular at BSLK ! Came towards for my birthday dinner with friends. Service was horrible. We had a party of 7. Party of 8 or more supposed to get charged with “large party fee” they put it on our bills anyways and the server barely came around and it wasn’t crowded at all...HORRIBLE service. Usually love this place but wow...may not be back for a while. The only reason we ate at this restaurant is because all of the other Omni restaurants were booked due to the Fan Expo convention. Four of us were pleasantly surprised, the food was really good. Be patient, as service from the seating to the wait staff, drink orders were really slow and the establishment was not crowded. Having a reservation did not expedite the seating, the hostess was not prepared to seat us. The food however was really good once we received. Drinks and food on average about 33.00 a person so be careful if you do not want to spend that much on sushi and noodles, but it was fresh and very tasteful. The miso sea bass with vegetables and miso soup were the perfect light dinner after a long day of work. Staff was below average. Not knowledgeable or attentive. Outstanding and creative food. Excellent preparation and good service. Nice ambiance - we were a group of 9 and had a table in the back alcove - quite private but not secluded. Food and Beverage prices were fair. We went here for dinner before we went out to celebrate my bachelorette weekend. The food was very good. We all ordered sushi and it came out super fast....at first. We had two food allergies at our table and it seemed as if our waitress wasn't interested in helping us after she found out we had allergies even though we came prepared having looked at their menu ahead of time. One of the members of our party didn't get her soup at all and her second roll of sushi came out SO late, we were all done eating. The waitress didn't offer an explanation or an apology or any compensation for it. The food was so good and the ambiance was very nice, but we were very disappointed in our service. We were one of the four groups in the entire restaurant on a Saturday night.... should have known that was a red flag. Even though the amount of staff they had on shift outnumbered the customers, the service was still very sub par. It took almost 30 minutes to get our checks split-up and was not correctly allocated. This location does not even compare to the one located on Cole. Waitress forgot to bring out drinks till after apps, then didn’t know how to open the wine bottle, then recorked it so tight couldn’t open again, then forgot to bring us our check though requested twice, and was working only one other 4 top and one 6 top. Good for a quick lunch bite but now a place for a date. The woman who owns the place had no record of my open table reservation. She said they don’t use open table which was confusing and she gave us some attitude when we said we had a table for 3 even though her restaurant was far from full. Besides that the servers and food were exceptional. Food was great! Our server completely forgot an extra order of vegetable tempura we had ordered just as our entrees came out. When we mentioned it after feeling like it should have come out, she's assured us it was just coming up. We received it shortly after but it was clear that it got put in when we said something because the veggies were still very firm. A simple mistake so not a big deal really. It wasn't very busy and we went in a Saturday night. Not sure why?? Try the crawfish roll. Surprisingly good!!! Terrible service. Waited for a table even though had a reservation. In fact the person told us she could not seat us at all at first. Then waited 15 min for s wait person to even acknowledge we were there. Brought wrong food and neglected to take items off of our bill that never came. Bad bad bad experience. Service was not very good even though we were the only people in the restaurant. Really disappointing quality of food for the price. Not going back. My boyfriend thought this was the best sushi we'd had together in Dallas! The spider roll and eel sashimi were amazing. Apps, sushi, all entrees are great! Restaurant was not that busy but wait staff could not handle the business. We waited 20 minutes before a waiter came to out table. We were close to walking out. Once they took our order, food did arrive promptly and was very good! The initial wait did put a damper on the evening. We ate there Friday, August 11. I ordered Sushi and my wife ordered the Korean hot pot or Bibimbap. The food was average to good. The atmosphere was so-so. The service was average. Not a great place but perhaps there were other items on the menu we could have tried that would have been better.